The Ultimate Fighting Championship 109 is really exciting and jaw-dropping. 6 February 2010 the Saturday night Local MMA fans had good reason to watch, and cheer, with Northwest natives in both the co-main and main events. Randy Couture took on, and submitted, Mark Coleman in the main event and Chael Sonnen took on, and man-handled, middleweight number one contender Nate Marquardt. The Ultimate Fighting Championship 109 was successful and top fighters of MMA earn good money through their fighting. 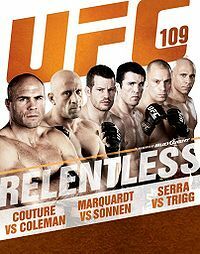 ButNate Marquardt and Chael Sonnen fighting was considered the best fighting of the night and these both are at the top of my MMA Pound for Pound rankings and these these two top fighter of UFC 109 awarded with $60,000 cash as bonus. Matt Serra Knockout was the best Knockout of the Night and Matt Serra awarded with $60,000 bonus cash as well. Heavyweight bout: Beltran defeated Gracie via TKO (punches) at 1:31 of round 2. This fight aired on the PPV broadcast following the Couture vs. Coleman main event bout. Heavyweight bout: Tuchscherer defeated Hague via majority decision (29-28, 29-28, 28-28). Light Heavyweight bout: Davis defeated Stann via unanimous decision. This fight aired on the PPV broadcast following the Maia vs. Miller bout. Lightweight bout: Emerson defeated Nover via unanimous decision (29-28, 29-28, 29-28). Lightweight bout: Guillard defeated Torres via unanimous decision (29-28, 29-28, 29-28). Lightweight bout: Danzig defeated Buchholz via unanimous decision (29-28, 29-28, 29-28). Welterweight bout: Serra defeated Trigg via KO (punches) at 2:23 of round 1. Middleweight bout: Maia defeated Miller via unanimous decision (30-27, 29-28, 29-28). Welterweight bout: Thiago defeated Swick via submission (d’arce choke) at 1:54 of round 2. Middleweight bout: Sonnen defeated Marquardt via unanimous decision (30-27, 30-27, 30-27). Light Heavyweight bout: Couture defeated Coleman via submission (rear naked choke) at 1:09 of round 2. Fighters were awarded $60,000 bonuses. Ultimate Fighting Championship (UFC) is one of my favorite mix martial sports. MMA fans had good reason to watch, and cheer, for their favorite UFC fighters. SOme of my favorites UFC fighters are Shamrock, Couture, Machida, Coleman, St. Pierre, and Brock Lesnar.